An 'Any time - Any Place' skin restorer spray mist. Can be used over make-up or au nature'. 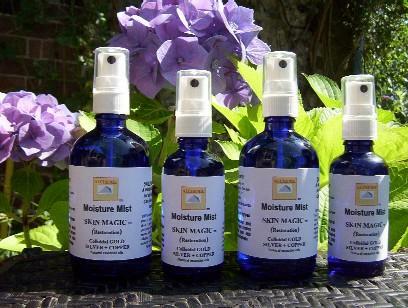 Contains Ultrafine Colloidal GOLD, SILVER and COPPER with essential oils. 100% natural and organic. There is nothing more to be said about this wonderful and magical skin solution - the one for all occasions. Join the Immortals over the past millennia - The Queens of Sheba, Neffertiti, Cleopatra....and now maybe YOU?